Outlines are an integral step in story creation. Now I know some writers don’t like or use outlines. They prefer to just write, with the freedom to make things up as the go. Kudos to you. If there was only one way to do things in life, life would be pretty boring. After all, an outline is nothing more than a map, a guide, a tangible gathering of your ideas… in other words, a blueprint of the story. 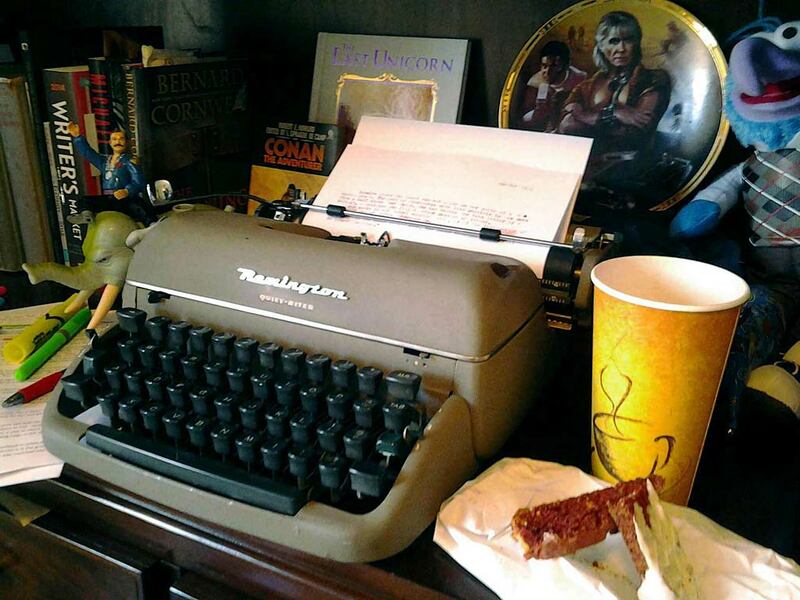 Now I consider myself a pretty solid writer (especially in Sci-fi and Fantasy), but damned if I don’t walk into the kitchen and forget what I went in there for… or get into the jeep without my car keys. And story has ridiculously more elements to remember than where a box of mac ’n cheese or set of keys are hiding. So for those of us who like to sharpen and oil our swords before we set off to slay the dragon, let’s talk outlines. “Ultimately an outline serves two functions. First, it allows you to hit all your necessary structural points: inciting incident, turns, reveals, complications, climax, the ending, denouement, etc… Second, it tells the story. An outline is like an insect with a two stage life cycle. (stay with me here.) You know like some bug that crawls in a hole, or spins a cocoon then comes away as a greater expression of its first form. ALL outlines start off in the Skeleton stage. Anyway, a Skeleton outline is basically a beat sheet. A list of core concepts, ideas and story points. 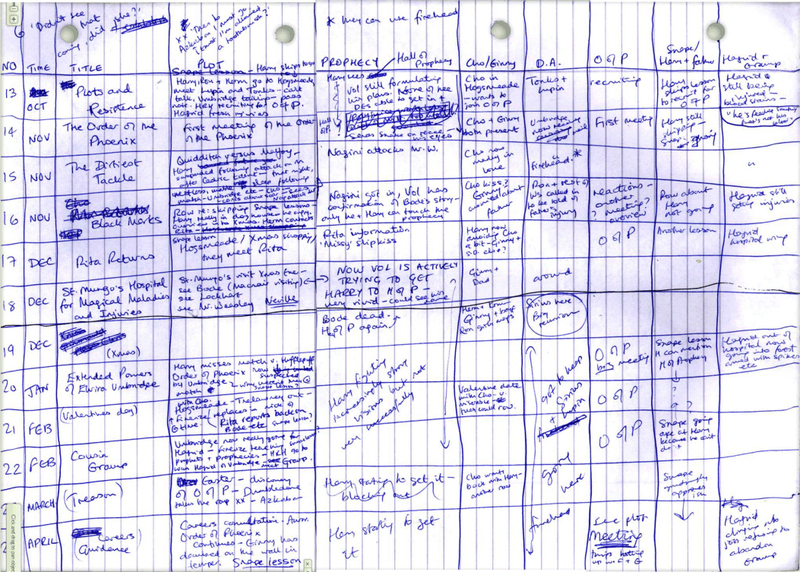 The famous one I like to direct people to is J.K. Rowling’s outline for Harry Potter, seen online here. Of course a Skeleton doesn’t have to be written in sloppy long hand. You can just as easily throw it together nice and neat in word, final draft of scrivener. Lot’s of writers who outline actually stop at the Skeleton stage. They don’t let their outline metamorphose into its second, Super Saiyan form. These folks get enough organization and direction from a Skeleton to start writing. I can, and have written from Skeleton outlines like this myself (usually when there’s a ridiculously tight deadline), nothin’ wrong with it. But Skeleton outlines are intimate documents which don’t require significant explanation from one writer to another. Your goal in the Skeleton outline is to jot down all your thoughts, the most fundamental points of the story. Of course, you’d throw in notes on character arcs, setting, dialogue and everything else imperative to your story. That’s the Skeleton. * Keep in mind your skeleton should be in some sort of progressive organization that makes sense to you and follows the flow of the story. In other words you don’t want your notes on the ending to be at the top of your list. Keep it sequential so it’s clearer when you go back to it later. The second stage of an outline, is the full on, Super Saiyan, ultimate version… or as I like to anti-climatically call it, the Comprehensive Outline. The comprehensive outline builds off of its Skeleton. You’re throwing some flesh on the skeleton’s core parts, working out your scenes and the story is taking shape. It’s a bit more complicated, and that means I get to blab about some of the specifics. When writing a Comprehensive Outline you want to tell the entire story, you want to paint the clearest picture you can, in the fewest words you can. One of the most common Comprehensive Outline problems I encounter with new writers in their relentless desire to focus on detail. Even if your Comprehensive Outline is going to be 20, 30 or more pages, you want to focus on keeping things brief. Brevity should be your goal. The outline isn’t the place to go into intimate detail. The script is where you go into detail. The outline is the in-between place. It’s where the rough ideas of the Skeleton get padded out with just enough info to get a clearer idea of what the final script will need. The Comprehensive Outline is literally your map and guide. You want a document that answers as many questions as possible–gives you direction. If you were lost, driving in downtown Detroit at 2am and looked to your road map and said either of those things above, you’re map is pretty damn useless. So when you put your Comprehensive Outline together, work on describing all the scenes in order. It should tell the story from start to finish. Again as brief as you can. Stay away from dialogue and tiny details, unless they are critical to understanding the overall story, or you know you absolutely want to translate them into the script. In the Dark Nova outline excerpt from the back of the Writer’s Guide, I relay some dialogue for the character Ivan in the first paragraph. I added this because I really wanted to capture the character’s personality at that introductory point in the outline. And I wanted to create specific conflict and tension between the characters. These were important enough points to convey in the outline. On the flip side of adding too much detail, don’t get lazy and leave gaps. “Oh I’ll just figure that out later.” No you won’t, you’ll get stressed out and hit a wall… figure it out NOW. The outline is the planning stage, that’s the WHOLE point of outlining… dummy. And don’t write so short, or summarize so much, that you don’t know where to go when you begin writing the script. This is especially important if you’re juggling multiple scripts and tend to take sudden and extended trips to Vegas. If your outline isn’t fleshed out enough, you could come back and find it stale, not remembering your train of thought or have any idea where you were headed. Spend ALL the time you need writing your outline. Writing the script is the easy part. The outline is where you really need to take your time. #2: One theme to rule them all. I talk about theme a bit in the book and have other articles about it here on the website. I’m mentioning it again now, because it’s simply that important. Most good stories have a few different themes within them, but every story has one paramount or master theme. All the events, characters, plots and literary devices support the master theme in one form or another. If your outline isn’t conveying your master theme, your outline is weak. If your outline doesn’t have a master theme, your Skeleton is missing a critical bone, and it’s not going to be able to stand up. Personally, I always include a Logline and the Master Theme at the beginning of my outlines. I dunno, but you notice that none of those options connect with the Master Theme. Turning to the Master Theme, the solution is simple. The actual sequence from the script: Harsh fights the kidnappers, jumps through a window and fights his way back to his ship to escape. This one example is NOT the main decision or defining moment of the MC… so you can see how repeatedly turning to the Master Theme can actually move the writing along and enforce the theme throughout the entire story. Master theme, make sure you have one. #3: Let your cats out of their bags. The outline needs to show the complete cycle and transition of the story, including all the major arcs. Don’t leave cliffhangers, or hooks in order to entice the reader of the outline (even if the reader is just you). Loose ends in an outline will only unravel later on. Let’s say you were writing the original Star Wars—don’t ask me to tell you what number that is these days. So as the writer, you know Darth Vader is Luke’s dad and you’re going to have an awesome reveal in the final script. Don’t just hint to it in the outline “Luke has suspicions of his father’s true identity” and then leave it out or ambiguous as a cliff hanger, thinking it’s such an important element of the script you already know it and would never leave it out. All arcs and transformations must be shown to their full expression and conclusion in the outline. Remember your outline is a blueprint, you wouldn’t leave off the toilets on a blueprint to a new house, thinking “oh wait till the new home owner sees where his toilets are, he’ll be so delighted” or “I don’t need to put the doors on the blueprint, of course I know where the doors go…” Uh-huh. This is not to say that you can’t have a story with unknowns, of course you can. What if we didn’t learn Darth is Luke’s dad until the second movie. OK, then it doesn’t need to be in the outline of the first story. Or what if we never find out what’s in “the bag” besides that bright golden glow. That’s fine. The point is any information that’s going to be relayed in the actual script, needs to be present in the outline.